Listen and repeat the ordinal numbers from 1 to 10 in Spanish. The masculine forms are written with the number and the symbol " º " at the top on the right. The feminine forms are written with the number and the symbol " ª " at the top on the right. Before a masculine noun, primero and tercero change to" primer " and " tercer ". - Quiero el primer libro - Quiero la primera revista* I want the first book - I want the first magazine. - Vivo en el tercer piso - Vivo en la tercera casa* I live on the third floor. - I live in the third house. * The feminine forms "primera" y "tercera" do not change. To refer to ordinal numbers higher than 10, we generally use the corresponding number. - Vivo en el piso doce. - I live on the twelfth floor. Listen and repeat the names of some buildings, places and objects that are found in a city. Listen and repeat the following expressiones which are used for giving directions. 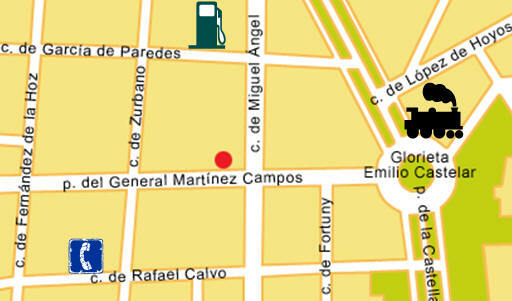 You are at the red dot and you ask two people for 'una gasolinera'. Only one of the them gives you correct directions. Listen to the conversation and decide which of the two gives you the correct directions. You are at the red dot and you ask two people for 'una cabina de teléfono'. Only one of the them gives you correct directions. Listen to the conversation and decide which of the two gives you the correct directions. You are at the red dot and you ask two people for 'una estación de tren'. Only one of the them gives you correct directions. Listen to the conversation and decide which of the two gives you the correct directions. Choose the correct article for each noun. However, a single compound noun can also be formed from a verb and a noun.